Starwood has just launched a new promotion for stays in Indonesia, Malaysia and Singapore. You may find some rates to be discounted by 50%. This offer is valid for stays until February 28, 2013, that are booked by December 20th. The rate code that this promotions uses is DALY50. Note that this rate code discounts UP TO 50%. The discount in most cases is much less. What I always do, when a hotel runs a rate promotion, is to check whether you can actually save money or not. When you are searching for rates, make sure that you click all the other pricing options as well. If you don’t, you will only see the DALY50-rates that are not always the cheapest. The DALY50 or Red Hot Deal rate is bit less than the rate that is discounted by 25%. You can also save few bucks here by booking this rate. Here this rate code makes absolutely no sense at all. 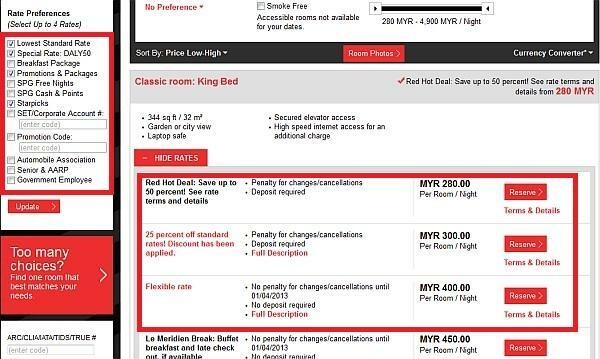 The flexible rate is 430 SGD and this “discounted” rate is 640 SGD. The lowest discounted rate is 388 SGD. Here the DALY50 is higher than rate that is discounted by 10% and includes a breakfast? Always make sure that you compare all the prices and not just the promotional ones. You should also have a look at all the other discount options that Starwood offers including Starpicks. The four examples above were randomly chosen. I would imagine that this rate would be the lowest sometimes but never really by 50%. It would be interesting to find out what is this imaginary rate that W Singapore discounts by 50% that is more than 50% higher than the best flexible rate?